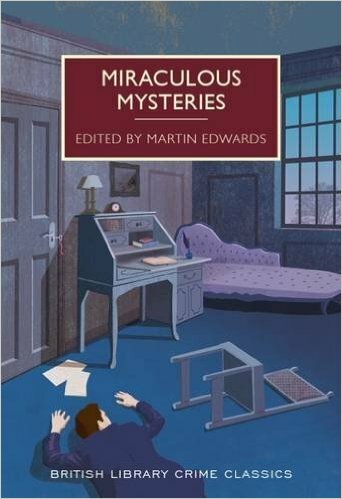 I'm delighted to have received my author copies of Miraculous Mysteries, my latest anthology in the British Library's Crime Classics series. The book is due out in a few weeks' time, but I thought I'd whet the appetite of locked room fans by telling you something about it now. And the first thing to say is that I've dedicated it to the memory of the late Bob Adey, from whose superb and truly unique book Locked Room Murders I have derived a vast amount of information and pleasure. Bob collaborated on the production of one or two locked room mystery anthologies himself, and I hope and believe that he would have approved of this collection of stories dealing with a wide variety of impossible crimes. I've included the work of several major authors, and although this particular book does not include anything by the American maestro John Dickson Carr, it's not impossible (so to speak) that future BL anthologies will feature his work. As usual with these anthologies, I've aimed to include some stories that are likely to be unfamiliar even to those well versed in the genre. Thus there are contributions from E.Charles Vivian, Grenville Robbins, and Marten Cumberland (best remembered as the creator of Saturnin Dax). 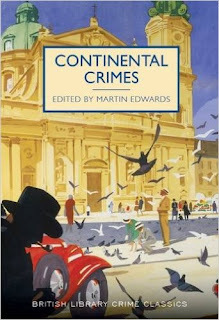 I really enjoyed putting this one together, and I'm optimistic that it will encourage even those who aren't Golden Age fans or enthused about locked rooms to sample the delights of this very enjoyable form of the crime story. In the early summer, there will be another Classic Crime anthology. This time it's Continental Crimes.- stories set in Europe long before the EU, let alone Brexit. 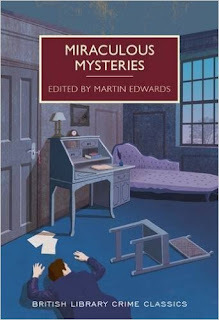 I'm delighted to say that an Agatha Christie story - not an especially well-known one - is included, as well as stories by authors as diverse as Ian Hay, E. Phillips Oppenheim, J. Jefferson Farjeon, H.C. Bailey,, and Michael Gilbert. Finally, a bit of news. I've just reached an agreement to compile two more Classic Crime anthologies - and that will take the total of story collections in the series to twelve. The BL and I are delighted by the way the book-buying public has responded to the short stories as well as to the novels (Crimson Snow,for instance, has done wonderfully well, with very good sales and equally gratifying reviews). And I can promise that there are some real treats in the books that are yet to come. Forgotten Book - Who's Calling? I'm an admirer of the American writer Helen McCloy. She wrote engaging prose and was a skilled plotsmith. She also took care to vary her approach, so that even her series novels, featuring the psychiatrist Basil Willing, are pleasingly different. A case in point is my Forgotten Book for today, Who's Calling? It was first published in 1942, and I was pleased to pick up a Dell mapback edition in the bookroom at Bouchercon in New Orleans last September. Frieda, a pretty but selfish young woman, is due to meet her boyfriend's family and friends when she receives a mysterious anonymous phone call, warning her off. Undaunted, Frieda goes to Willow Spring to meet the clan. Before long, someone is murdered. But it isn't Fieda. What's more, the murder method was that splendidly time-honoured method- yes, one of my favourites, poisoned chocolates! Basil Willing is called in to assist the investigation, and his professional expertise is crucial in unravelling the mystery. In some ways, it seems to me that this book anticipates one that is rather better known, Beast in View by Margaret Millar, which appeared more than a decade later. I'd be interested to know if anyone else sees the parallels that seem to me to be quite striking (though I should add that Millar makes very good and original use of the central idea). This is a highly readable and cleverly constructed mystery. Even though I figured out the identity of the culprit, I didn't pick up all the clues. There was one aspect of the story, concerning Frieda's reaction to the phone call, which I thought wasn't quite "fair play", but overall this is a crime novel that I can definitely recommend. McCloy was an excellent writer whose work deserves to be celebrated. Last weekend I did something completely different - presenting a two-day course on Classic Crime at the British Library. It's yet another fascinating project that has spun out of a relationship that I find truly rewarding. The BL people are great to work with. But I must admit that when I was invited to present a substantial course I was rather daunted. A talk for an hour is one thing, this was quite another. One option was to present the course in three weekly instalments, but that wasn't practicable for someone living in Cheshire. It was much easier to focus on a single weekend in London, even though it meant that the course would be intensive. We agreed a plan, and the course was marketed. In the back of my mind I had the comforting thought that if nobody signed up, I'd have the perfect excuse not to worry about it any more. What actually happened was that the course sold out within a very short space of time, and there was a waiting list for cancellations. This unexpected development meant I really had to focus on how I was going to do it. Fortunately, Andrew Nelson of the Library proved extremely supportive. 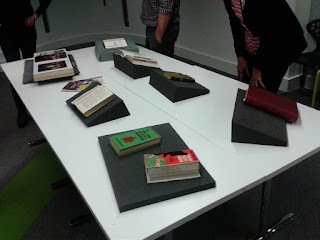 Already in the plan was a "show and tell" in which curator Kathryn Johnson would talk the attendees through various rare items in the BL collection. I decided to add two more special features of my own, but keep them as surprises until the course actually began. Today the Crime Writers' Association has announced that the winner of this year's CWA Diamond Dagger is Ann Cleeves. This news gives me special pleasure for two reasons. First, now that I'm the Chair of the CWA, I shall be the person to present Ann with the Dagger at the CWA Daggers awards dinner in London in late October. Second, she just happens to be (and it is a coincidence, I can assure you) one of my oldest friends in the crime writing world. Later I met Ann in person - via the CWA - and we became friends. We both joined up with Murder Squad when Margaret Murphy founded it, and this led to many shared events. The first photo below, taken by Zoe Sharp, shows the original Squad line-up, including the late Stuart Pawson. The second, taken in her back garden at Whitley Bay, shows her with her husband Tim and CWA Northern Chapter doyens Peter and Margaret Lewis. I read and reviewed The Crow Trap, then apparently a stand-alone novel, and I like to think I was one of the very first to spot the potential of Vera Stanhope as a character. After many years of working quietly away, in recent times, Ann has found fame and fortune thanks to the televising of her series about Vera and about Shetland's Jimmy Perez. Her story is a happy one. Her career (because she was writing good books many years before she became widely-read; I vividly recall us discussing how modest an income one could manage to live on as a writer) is a good example of why one should never lose faith. Yet she's always remained a good friend to readers, writers and libraries. Part of the point of the CWA Diamond Dagger, in the view of the CWA committee, is that it recognises not only the sustained excellence of a person's body of work but also their overall contribution to the genre. Nobody can be in any doubt that Ann is a very worth winner indeed. Elspeth Huxley knew Africa very well, and wrote about it on many occasions with considerable insight. She also dabbled in detective fiction, and knowing that some good judges rate her very highly, I was glad to pick up a copy of her 1938 book Murder on Safari, which features her likeable cop Superintendent Vachell, a Canadian who has moved to East Africa. Vachell is approached by a well-known hunter called Danny La Mere, who has been leading a safari funded by wealthy Lady Baradale. Absurdly, her ladyship has brought thirty thousand pounds' worth of jewels on the trip. When they are stolen, one is almost tempted to think it serves her right. But Vachell, a touch improbably, agrees to join the group, pretending to be a hunter himself, with a view to tracing the thief. Vachell's cover is soon blown, and things go from bad to worse when her ladyship's remains are found - or what's left of them after the vultures have been at work. At first, it seems that she was killed by an animal, but it emerges that she was in fact a victim of murder. Before long, a second death occurs. This is a classic "fair play" mystery, complete with cluefinder footnotes at the end which remind the reader of the evidence on which Vachell built a case against the culprit. This is a well-written mystery, and although I'm not in any way tempted to go on a safari myself, Huxley's presentation of life on safari has a very authentic feel. I didn't warm to most of the characters, but even so, I found myself admiring her way with words. A film about two crime writers - what could be better? Well,what if one of them were heroic and handsome? Yes, that's better. And what if the other were deranged and homicidally inclined? Perfect! These are the key ingredients that meant I found the chance to watch Torment irresistible. I absolutely deny that the screenplay based on real life incidents in the crime writing world! Torment was known in the US as The Paper Gallows (a title explained near the end of the story, and a rather good title, too, which deserves a fresh life). The director was John Guillerman, whose best known work in the crime film genre was the lavish production of Christie's Death on the Nile in the late 70s. He also came up with the script. It's a young man's work, and not short of energy if rather lacking in sophistication.. The two Brandon brothers are Jim, a very successful writer, who shares his posh house with his brother Cliff. The pair are played by Dermot Walsh (whom I recall from my youth as the star of Richard the Lionheart a series that I watched avidly when I was a child) and John Bentley, who was best known for starring in Crossroads, a TV show which in contrast I made sure I avoided.. Cliff, poor fellow, dreams of writing the ultimate crime novel. Any temptation I had to identify with him was killed off early on, even before he did away with the family cat, horrid fellow. The Brandons have a pretty young secretary called Joan. She fancies Jim, but Cliff fancies her. It's a recipe for calamity, and calamity duly follows. This is a short, snappy film, quite engaging if not, I'd like to think, entirely authentic in its portrayal of a crime novelist battling his demons. . I'm delighted to bring marvellous news for locked room mystery fans. Locked Room International will, at the start of March, be publishing Death in the Dark by Stacey Bishop. This novel, set in New York City, was originally published in 1930 as one of pair of books issue experimentally by Faber with pictorial boards and no dust jacket. It has subsequently become one of the most sought-after rarities among crime novels. Prior to this edition, no English language reprint has ever appeared. I'm sure the arrival on the market of a nicely produced and very affordable copy will be greeted by collectors with a good deal of pleasure. John Pugmire of LRI deserves great credit for bringing the book back to life - and he's already been rewarded by a starred review in Publishers' Weekly. I've written an introduction to this new edition, and there's also a fascinating Afterword written by the author's nephew and executor. Mystery has, suitably enough, long surrounded this book. Julian Symons talked about it in Bloody Murder, and suggested that there was in fact another Stacey Bishop book out there somewhere. Plenty of people, including me, have tried to track it down, but it now seems clear that this novel was a one-off. Sometimes the question of what counts as a "forgotten book" is open to debate. One might use that term to refer to books by living authors that have been out of print for a long time, for instance, But I think there can't be any doubt that Roy Horniman's 1928 novel The Viper qualifies for the description of "forgotten". I've never come across any discussion of it anywhere. If you do an internet search for the book, you may however find that I mentioned it here rather more than seven years ago. At the time, I'd just purchased a copy, though I confess that I've only just got around to reading it. I mentioned The Viper in the context of a discussion about Roy Horniman's most renowned book, Israel Rank. Though "renowned" is a relative term here; Israel Rank is a fascinating novel, but compared to the film version, that wonderful classic Kind Hearts and Coronets, it is still somewhat undeservedly neglected. Why did it take me so long to read the book? One reason is that I was deterred by the opening paragraph, one of the dullest one could imagine, which is about train times from Weston-super-Mare to London. It makes the more tedious passages of John Rhode/Miles Burton seem as sparkling as Simon Brett or Colin Watson. But soon the story warms up, and it becomes clear that one of the travellers on that train is a sociopathic monster. This fellow is a con man who is prepared to stop at nothing to get his way. He has his eye on a fortune, and he is ready to kill the innocent in order to lay his hands on it. In this respect, at least, there is some overlap with the famous storyline of Israel Rank. Perhaps Horniman was aiming for a comparable effect. But I can't claim that this book is a classic, although there are some nice ironic touches. Instead, what we have is a thriller that is, thank goodness, livelier than that opening paragraph suggested. Not a masterpiece, by any means, but quaintly readable. The Crime Writers' Association has a new Chair. I can tell you this authoritatively, because it happens to be me. Len Tyler, who has piloted the CWA with aplomb for more than eighteen months, has stepped down early, because of the scale of the workload of the Chair's role. So I've taken his place. And the first thing I'd like to say is what a pleasure it's been working alongside Len as his Vice Chair. I wish him all the best with his writing projects, and very much hope he'll become involved again with the CWA at a future date once he's met a few killer deadlines. As it happens, this year sees the thirtieth anniversary of my joining the CWA (I was only a lad at the time, you understand....) Shortly after I joined I was contacted by Peter N. Walker, and invited to the inaugural meeting of the CWA's northern chapter. That was a great occasion, if thinly attended. Reginald Hill, who was there with his wife Pat, dubbed us "the Few". That day I met Peter for the first time - long before he became famous as the guy who created Heartbeat. As well as Reg, I met another future CWA Diamond Dagger winner, Bob Barnard, and his wife Louise. Plus Peter Lewis, biographer of Eric Ambler, and his wife Margaret Lewis, biographer of Ngaio Marsh. What I remember vividly is how kind they were to a young chap from Cheshire they knew nothing about. We all became friends, and my admiration for them all will never falter. That experience also makes me feel strongly that looking after newcomers to membership is so important, just as is making sure that long-standing members continue to feel valued. Before long I started going to CWA annual conferences, where I met many delightful people. Some are still around, some are not. All of them, pretty much without exception, were great fun to be with. Youngish writers by the name of Val McDermid, Ann Cleeves, and Margaret Murphy among others joined the northern chapter and I enjoyed their company as well as their books. Margaret formed Murder Squad in 2000, and this collective of writers is still going strong. I am not by nature a very sociable person. Like many writers, I'm content with my own company and I often prefer it to the alternative. But I've found the company of my fellow crime writers truly life-enhancing over the years. The CWA is a terrific organisation and it's very significant that it has grown to a point where it's now bigger than at any time in its history of over sixty years. Its Daggers (their trademarked logo heads this post) are world famous. This is quite something in an era where membership organisations generally tend to be in substantial decline. Of course, I am proud to have been picked to lead the CWA. And I'm startled to find that I'm the only person to have been both Chair of the CWA and President of the Detection Club at the same time. Inevitably I'll make a few mistakes as I try to move things forward, but I plan to do my best to make sure both organisations look after their members, and continue to play a significant part in the crime writing world, here in the UK and further afield. I'm delighted to announce an event that I think will be of great interest to crime fans, whether their tastes lie in classic or contemporary crime writing. Even better if you enjoy both! 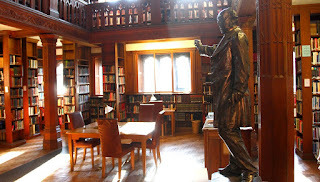 The event is called Alibis in the Archives, and it will be held at Gladstone's Library from 9-11 June. The library is in Hawarden, Flintshire, but for anyone unfamiliar with that corner of North Wales, it's only a short distance - a bus-ride of twenty minutes - from Chester and it's close to the motorway network. The event will celebrate the launching of the Crime Writing Archive at Gladstone's Library. This takes the form of two separate but distinct archives, for the Crime Writers' Association and for the Detection Club respectively. The former archive is much more substantial than the latter at present, but I do see this as a landmark moment in the history of crime fiction heritage. Donations of relevant materials to the archive are, of course, warmly welcomed, and the process of developing the archives and cataloguing them is ongoing. So what will be happening over the weekend? Plans are afoot to make it not only be interesting but also a bit different. So there will be at least one interactive murder mystery evening, plus talks from a range of writers, including Ann Cleeves, who will be discussing Vera and Shetland among other topics. I'm really looking forward to it, and if you would like to book, the Library's expertise in event management is such that I'm confident you won't be disappointed. Forgotten Book - Which Way Came Death? Which Way Came Death? written by Faith Wolseley, and published by John Murray in 1936, is my Forgotten Book for today, and it really is forgotten. I'd be very surprised if more than one or two of my readers have come across it. And yet it was, in its day, a very well regarded and well reviewed novel. With some justice, I should say, as the writing is elegant and often witty. The book is presented as a first novel, yet although it was the first under the Wolseley name, it was not really a debut, for the author had previously dipped a toe into the waters of detection with two books under what was, I understand, her real name, Stella Tower. Dumb Vengeance, which really was her first novel, was one of my Forgotten Books recently. The Tower book was set in a country house. The Wolseley novel is set against another background that was popular in Golden Age detective fiction: the public school. Anthony Berkeley, James Hilton, Nicholas Blake, Christopher Bush and Gladys Mitchell were among those who made good use of school setting in the Thirties, but the wit and insight into school life in this book calls to mind R.C. Woodthorpe's The Public School Murder. Wolseley's writing did not have the political edge of Woodthorpe's, but is none the worse for that. It becomes clear early on that a schoolmaster called Stoner is the likely murder victim, and we are led to believe that poison may be the murder weapon - but how will it be administered? The head teacher's wife is a memorable character who plays a central role in the story, and I was not surprised to discover that the author was herself the wife of a public school teacher. The story flags a bit in the middle, as in Dumb Vengeance, before perking up again. The plot is nothing special, but the quality of the writing lifts this one out of the ordinary. Labels: Dumb Vengeance, Faith Wolseley, R.C. Woodthorpe, Stella Tower, The Public School Murder, Which Way Came Death? I'll be featuring a Forgotten Book tomorrow as usual. But first - it's Unforgotten time! Yes, the ITV drama that keep millions engrossed just over a year ago is back with a new cold case mystery. It aired this evening, and the first episode suggests that the key elements of the narrative structure will resemble those which worked so well the first time around. This means a return for the detective duo played by Nicola Walker and Sanjeev Bhaskar, who make a very good combination. There is contrast between their characters and lives, but their relationship is not as edgy as that of so many cop pairings, and that's something I find rather refreshing. Workmen engaged on dredging a river discover a suitcase, and when they open it up, they find inside the remains of a body. There's no obvious clue to the person's identity, but two significant items are found: a man' s watch, and a pager. Having establish that the deceased was stabbed, the first question for the police is: who was he? I'm hoping there's a very plausible reason why the killer left the watch and pager in the suitcase. It turns out that the crime dates back just over a quarter of a century. We're introduced to a number of suspects, including a barrister who, despite his apparent urbanity, reacts furiously to provocation. A clue? Or is it too obvious? There's a teacher in the mix, and also a nurse. And what of the dead man's wife - who is herself a cop? Chris Lang's script kept me engrossed, and I'll definitely be watching this one take its course.. I first read Julian Symons' novel The Narrowing Circle when I was a teenager, but until recently I was unaware that in 1955 it was filmed. The screenplay was written by Doreen Montgomery, a very experienced writer for film and television, who is said to have created the character of Emma Peel for The Avengers. The novel is a good example of post-war psychological suspense fiction. Symons was one of the British pioneers in this field, although his fiction is much less well-known than that of Patricia Highsmith,the legendary American writer, whose work he much admired. The story charts the battle of wits and wills between writer Paul Nelson and the relentless Inspector Crambo. The film is more conventional, and in terms of both plot and style, it owes almost as much to that Cornwell Woolrich classic Phantom Lady as it does to Symons' novel. A colleague of Nelson's wins promotion at Nelson's expense, and for good measure nicks Nelson's girlfriend. When he is found dead in Nelson's apartment, Nelson relies on an alibi. He'd gone off to drown his sorrrows, picked up a prostitute, and spent the night in a seedy hotel. But when Crambo checks the alibi, the chap at the hotel denies all knowledge of Nelson, and the girl cannot be found. The story is told with some pace, which compensates for the flimsiness of one or two of the plot twists. I don't know what Symons made of it, though I suspect he wouldn't have been thrilled by its lack of subtlety. But it's a perfectly watchable British B movie, with Paul Carpenter as Nelson and Hazel Court as a woman who falls for him and then helps solve the mystery, with such stalwarts as Basil Dignam, Russell Napier and Ronnie Stevens in the cast. Let me start the year's blogging by wishing everyone who reads "Do You Write Under Your Own Name?" all the very best for 2017. Here's hoping it's happy and healthy for you, with lots of good books to read. For me, this is going to be a very busy twelve months, and I'll be explaining why in a few days' time. At this stage, though, I'd like to focus on what is in store for readers of this blog and my writing generally. The key brand new publication will be The Story of Classic Crime in 100 Books, which will appear under the imprint of the British Library (in the US it will be distributed by Poisoned Pen Press). I've worked on this for quite a long time, and it's benefited from the input of several experts, most notably Nigel Moss and Barry Pike. I must say I'm excited that it's now nearly ready to hit the presses. 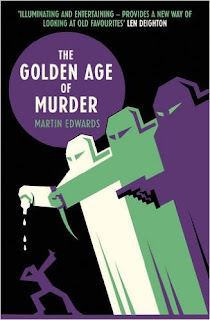 It's very different from The Golden Age of Murder, but I really enjoyed writing it, and I hope it will give crime fans plenty of entertainment. I don't yet have a precise publication date, but I'll keep you posted. I'm also working on three more anthologies for the BL, while there will be plenty of intros to books in the Classic Crime series. I've also just written an intro for a book to be published by Harper Collins, and an extraordinary long lost classic for Locked Room International, as well as for a collection of locked room novels to be brought out by the Folio Society. This year will also - I very much hope! - see the publication of Taking Detective Stories Seriously, a collection of the reviews of Dorothy L. Sayers with a lengthy commentary by myself. The Sayers Society are producing this book, and I'm looking forward to its appearance. The reviews are truly fascinating.